I coach endurance sports of triathlon, running and cycling. I love working with all levels, from empowering those new to the sport, to taking athletes to the next level by refining their sport to reach their full potential as an endurance athlete. Utilizing WKO4 for power analysis, and TrainingPeaks software to continually communicate, monitor and assess training. In addition to coaching, I am a competitive Ironman athlete and a marathoner. Along with multiple podium and AG wins, have qualified for Ironman 70.3 World Championships five times. I also am married with 4 kids, so juggling training and life is my second language! As a coach, I work with athletes not only to reach their goals for this season, but to continue to become their best for years to come. 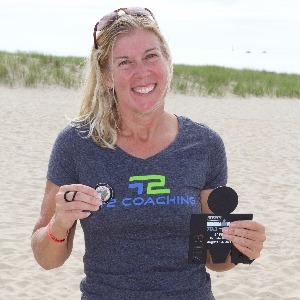 I am also a director of a computrainer center, founder and coach of Girls Gone Tri club and also USAT, USAC, USA Masters and TPU Certified coach. Precisely establishing and following correct intensities, zones and monitoring biofeedback is the foundation to success. Heart rate monitoring is key in understanding how you as an athlete progress and recover from each workout. I will evaluate workouts to understand how effective they are for you by monitoring the progression of pace/power and decoupling. True aerobic gains are made by balancing aerobic stress and adaption to recovery, the foundations of endurance sports. Making an effective race plan allow you to race not only stronger, but smarter to take your sport to that next level. I take learning and education seriously, and love that it is never ending process. I am a Registered Nurse, USAT lvl 1, USAC lvl 2, USAM lvl 2, Swim Speeds Secret, WKO4 and TrainingPeaks lvl 2 certified coach. In addition, I travel frequently to spend time with the leaders and innovators of our sport to more to bring to my athletes every day. I ask that athletes have and utilize heart rate and power. Success. Coach Christine Schirtzinger has been notified of your message. To hire Christine Schirtzinger as your coach, select the coaching service that is right for you.